Your Guide to Collecting Art Nouveau Antiques. The Art Nouveau style and its influences. From Liberty & Co. to Rene Lalique, Louis Comfort Tiffany, Anton Gaudi and Archibald knox. The art nouveau style was a conscious attempt at modernism and a determined departure by many artists and designers, from the traditional victorian forms of design. Designers rejected the inspiration of classical European art and instead looked to Japanese, Celtic and other folk art as a basis for their work. This can be seen in works by artists such as Gustav Klimt. Typical Art Nouveau motifs come from nature: flowers, insects and birds. Natural lines curve and wind sofly. Straight lines were scorned by Art Nouveau designers. Symbolism is important in the designs. For example a leaf may be just a leaf or perhaps it is part of the female body. Designers used forms from the natural world in ways that suggested they might represent human limbs. They used traditional materials like wood, glass, and pewter. The Art Nouveau style, which literally means "new art," gets its name from a design shop, La Maison de l’Art Nouveau, which German entrepreneur Siegfried Bing opened in Paris in 1895. The shop was one of the major outlets for the glass of Emile Galle, the art glass of Louis Tiffany, the jewellery of Rene Lalique, and the furniture of Eugene Gaillard and George DeFeure. All signature artists in the art nouveau tradition. These artists were largely reacting against the Victorian aesthetic, a style described by Arlie as often fussy and inhibited. A favourite art nouveau theme was a nymph with flowers in her abundant streaming hair. She appeared on the posters of Alfons Mucha and among the opals and moonstones of René Lalique’s jewelry. 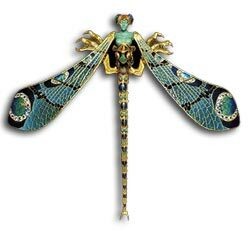 Other favourite art nouveau themes included peacocks, dragonflies and moths in brilliant enamels and gold filigree. Other botanical forms were arranged in abstract patterns and were symmetrically arrayed around mirrors and picture frames or repeated on fabrics and wallpapers or in mural decorations. Art Nouveau was out of fashion before World War I had begun. From the 1920s to the 1950s it was considered by critics as a moribund and even ugly style. However, around 1960 a revival began. In reaction to the unimaginative glass steel rectangular architecture of the 1950s and the british ‘Utility Scheme’. Critics began to turn back to the style of the 1900’s. Numerous exhibitions were held, scholarly publications on art nouveau began to appear, and prices for art nouveau objects soared. Art Nouveau was incorporated into the rebellious psychedelic style of the 1960s and finally achieved its place as a significant style in the history of modern art. It is only comparatively recently that art nouveau was accepted as a ‘style’ and accorded any real recognition. It had been seen as a collection of different styles with little in common except, perhaps, a taste for excess and flamboyant decoration. Not only is there no consensus on exactly what art nouveau is, there is even some argument over the period it covered although generally it is thought to cover the 1890s through to around 1910. Art Nouveau was not universally acclaimed, particularly in England. Many critics of the period saw it as decadent and self indulgent. In London the famous Liberty department store had been instrumental in encouraging and promoting arts and crafts. But Arthur Lasenby Liberty, its proprietor, also knew many of the art nouveau designers and in the 1890s he promoted art nouveau in both his London and Paris stores. 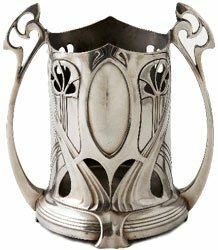 In Italy, art nouveau was known as ‘Stile Liberty’ because it was linked so closely with Liberty & Co.
Liberty sold work by designers like Lindsay P. Butterfield, who produced textiles and wallpaper; and Archibald Knox who designed a wide range of pewter, jewellery, carpets and clocks.